Editors: Osborne Jr., Allan G. and Russo, Charles J. 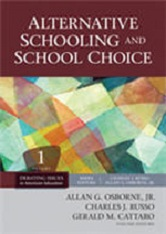 This volume in the point/counterpoint Debating Issues in American Education reference series tackles the topic of alternative schooling and school choice. Chapters explore such varied issues as charter schools, for-profit schools, faith-based schools, magnet schools, vouchers, and more.